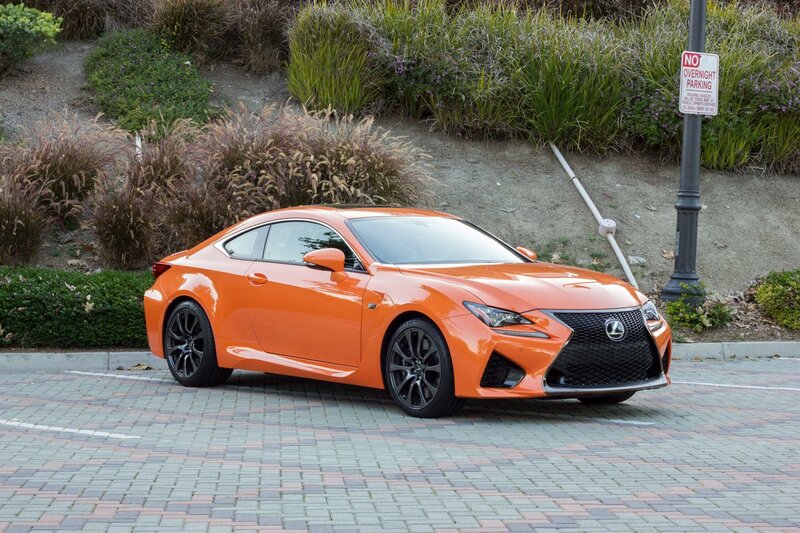 The 2015 Lexus RC F starts at $62,400 and tops out over $70k with the right options. 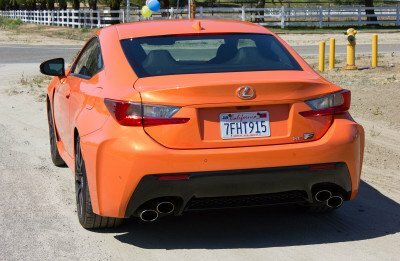 Having driven the 2015 Lexus RC F (several of them actually) around one of the most beautiful tracks in the US (Monticello in NY), I felt as though I didn’t have enough time to really soak in what the car was like on the street. It was a lot to process at once. The engine was new, the chassis was new (sort of, but we’ll discuss this later), and there are several variants of this particular vehicle with many different configurations. So I focused my attention on specs and driving dynamics at the track. I skipped over or flat-out ignored anything applicable for the street, because I was sucked into a trance of driving a 450+ hp car around a 4.1 mile long road course. Now that the dust has settled, Lexus has been kind enough to let me drive a Molten Pearl RC F for a week so I can better understand what makes this vehicle so special. This isn’t a numbers game. Let’s start with the nitty gritty specs. This car makes 467 hp @ 7100 rpm, and 389 lb-ft at 4800 rpm from a 5.0L naturally aspirated V8 engine. This is more horsepower but less torque than an M4, which is powered by a turbocharged 6 cylinder engine. 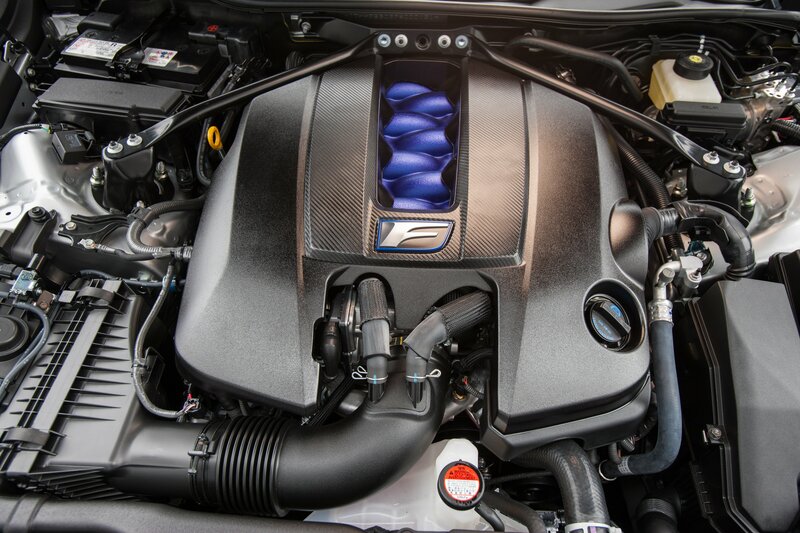 The RC F weighs more, but uses an 8 speed direct-shift automatic transmission. Meanwhile the M4 has an optional 6 speed manual or 7 speed DSG style transmission. These all make for very different driving characteristics, and not something that a spec sheet is going to fully illustrate. This review isn’t a comparison test to the BMW M4 or Mercedes Benz C63 AMG. That’s been beaten to death already, and quick Google/Youtube search will show you days’ worth of info on why different people favor each one. Sure the M4 has better straight-line acceleration, but how often are you driving at 100%? What about how the car behaves in normal conditions where most people actually drive these cars? These are all important things to consider, and a conundrum that sparks some heated debates online. I’ve driven multiple versions of each vehicle in their entire Lexus fleet, and there’s a strong sense of unity among the lineup. Aside from the LFA, the RC F is perhaps the most radically different vehicle Lexus has made. It features a currently exclusive 5.0L V8 motor, with equally exclusive front and rear brakes. 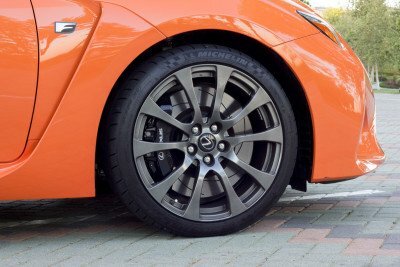 Massive 14.9″ slotted front rotors are squeezed to death by six-piston monoblock calipers made by Brembo. The rears keep up through use of 13.5″ slotted rotors with four-piston Brembo monoblock calipers. 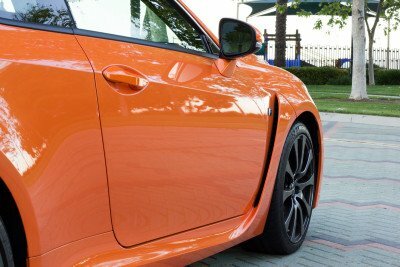 That kind of clamping power is necessary, for this is not your beefed up Scion FR-S. 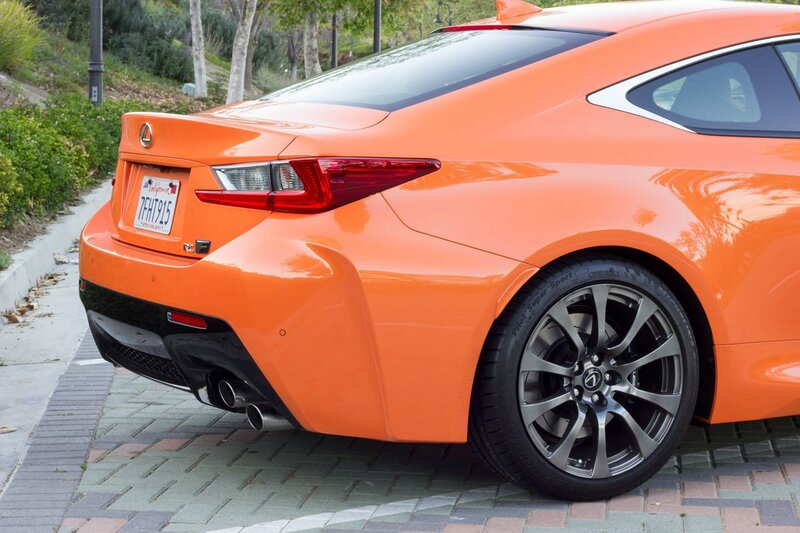 The Lexus RC F weighs in at 3,958 lbs. This is almost 400lbs heavier than the Lexus IS 350. 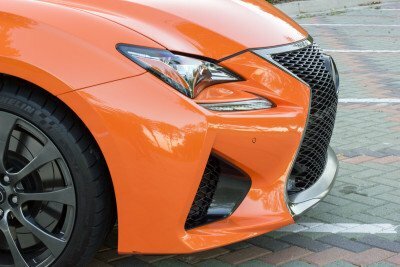 The weight of the RC F is attributed to several factors. The chassis is a blend of three different cars in one. 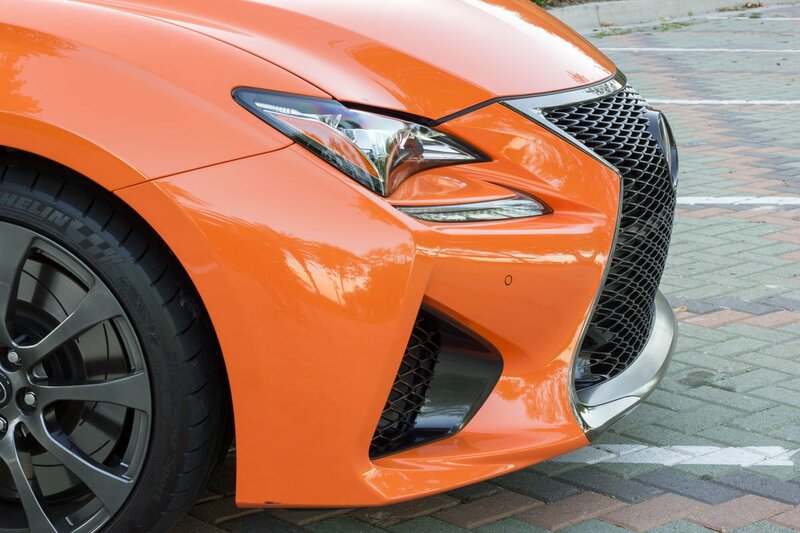 The front is from the current Lexus GS, the center section from an IS convertible, and the rear is from the Lexus IS sedan. All three are mated together with extensive and highly advanced welding and fusing techniques. The chassis is incredibly stiff as a result, and the car feels extremely solid on the road with no indication of body flex. 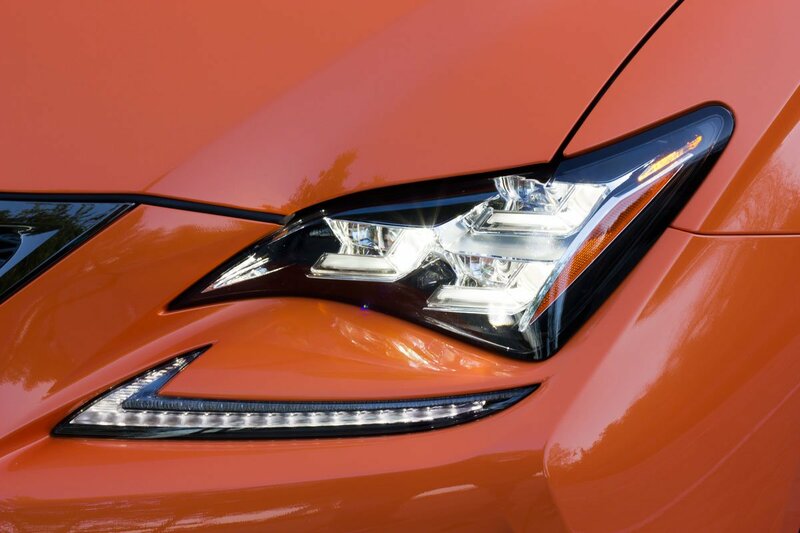 There is only one drivetrain option available for the RC F, and that’s an 8-speed direct shift automatic. Lexus had to make an important decision when going with this transmission. Manuals and DSG transmissions are better on the track, but they sacrifice a little bit of comfort and drivability on the road, especially in stop-and-go traffic. Lexus chose this transmission because it is best suited for where the car will spend 95% of it’s time, the road. A standard automatic is extremely smooth at low speeds, but typically has a performance handicap. 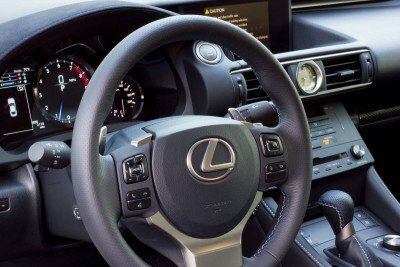 Lexus countered this by offering different driving modes that lock the stall converter (hence, direct shift) from gears 2 through 8. This closes the gap to the more performance-oriented transmissions, and offers shift times of a few tenths of a second. A g-sensor will keep the gears in higher rpm if you are taking a turn at high speeds in automatic mode. Putting the car in manual mode allows you to take advantage of the large, steering-wheel-mounted paddle shifters and fly through the gears as you have some fun. There’s even a dynamic rear spoiler that pops up after 50 mph (80 mph in Eco mode) and drops back down below 25 mph. It’s a nifty feature that enhances the high-end appeal of the car. 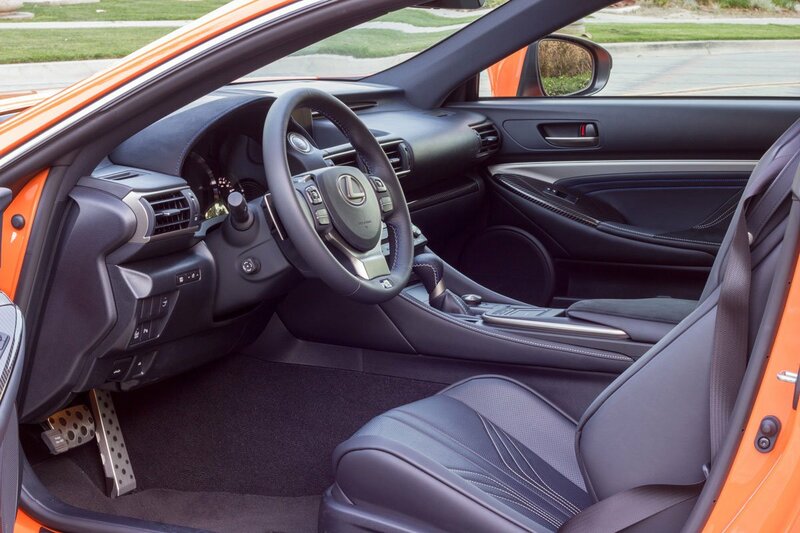 The best way to describe the interior is by the combination of the Lexus IS and Lexus LFA. The cockpit style layout has a high center console that builds around your seating position. You feel nice and low in the car, but visibility is still easy to cope with. A dynamic backup camera provides guidance when backing into a tight spot. The steering wheel is bolstered with nice grips at the 10 and 2 position, and the paddle shifters move with the wheel input. I was able to comfortably reach all controls for the stereo, climate control, and driving assists without moving from a comfortable position in the driver seat. Like the new Lexus NX, the RC has a trackpad style controller for interfacing with the stereo and navigation system. Physical buttons are also present for things like changing stations, volume, etc. The seats are marvelous and hug you ever-so-gently. The stitching pattern is designed to provide maximum “traction” which helps keep you from sliding around during spirited driving. This small detail is great because it allows you to stay in place without having seats so aggressively bolstered that larger folks become very uncomfortable. The seat heating and ventilation modes keep your body comfortable, regardless of ambient temps. Rear seat legroom is acceptable but not vast, considering the overall length of the car. It’s a true 2+2, with no center seating position available in the back. All in all, it’s a gorgeous and elegant interior that I do not expect to look dated any time soon. This is where most people are interested. Sure track times are cool and all, but I’d venture to say that most people buying an RC F will be using the car on the streets much more so than the race track. With 467 HP on tap, I expected dismal fuel efficiency. I put the car in Eco mode which kept the electronic spoiler down up to 80 mph and drove for about an hour on the highway with light traffic. I ended up getting 25.3 mpg, all while cruising at approximately 80 mph for the majority of the drive. That’s quite a feat for a 4,000 lb car that hits 60 mph in 4.4 seconds. The steering is nice and heavy, which translates to a firm steering feel. This makes you feel more connected to the road and builds driver confidence. On normal mode, the shifts are incredibly smooth and typically stay below 3,000 rpm. Sport and Sport+ modes wake things up a bit with more aggressive shifts, increased suspension stiffness, and even dynamic gauge layouts on the dash. That’s right, each driving mode changes the way speed and rpm data is communicated to you. An audible beep occurs after 7,000 rpms letting you know when to upshift if you’re in manual mode. Fail to shift in time, and the computer lets you bang the rev limiter a few times before eventually stepping in to get things back in order. 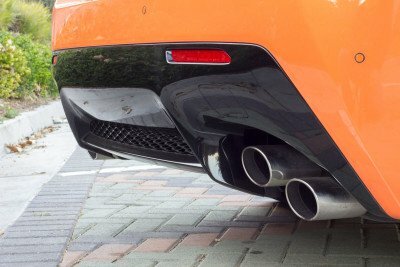 The exhaust note is throaty but subtle enough to drive through a suburban neighborhood late at night. At wide open throttle, the naturally aspirated V8 wakes up and even overpowers the exhaust note, which seems more like a supporting artist than the main singer at this point. The intake system howls and screams for more as you fly through each gear and an unbelievable pace. The high speed driving experience is more than just how fast the car accelerates. It’s about the noise, the smell, the feel of the steering while, the blip of the throttle on downshifts, and then getting the back end to step out just because you can. This is one of those cars that allows you to do all of this, but instead of loading the car up on a trailer after track day, you can just drive home in the comfort of a gorgeous cabin. Not too many cars can do a little bit of everything, and if you’re looking for a high performance coupe, this is one of the best options on the road today. This is a car that will have a lasting impression on me. It’s refreshing, ridiculously fast, civilized and so much more. It’s a car that instills a sense of accomplishment when you drive it. You are rewarded with luxury when you need it, and breathtaking speed when you crave it. It touches every impulse imaginable and becomes part of your daily routine. I’ve said it before when I initially reviewed this car, and I’ll say it again, Lexus really hit this out of the park. If this car is in your price range and you want a performance coupe, I strongly suggest considering this at the top of your list. This dynamically shifts power to the left and right rear wheels to maximize traction and performance. There are also three different modes which offer unique handling characteristics. The vertical vent behind the front wheels helps improve aerodynamic efficiency and helps to cool the massive front brakes. A Performance Package provides a carbon fiber roof (no more moonroof) and a carbon fiber rear spoiler, along with aforementioned Torque Vectoring Differential. The active rear spoiler comes up at 50 mph in normal driving modes. In Eco mode, it comes up at 80 mph. The spoiler automatically retracts below 25 mph. Sharper throttle response, faster and more aggressive shifts with direct shifts on gears 2-8 (gears are directly engaged like a manual), stiffer suspension. An optional 835 Watt Mark Levinson audio system sounds absolutely amazing and blasts through the car with 17 speakers and a 12 channel amplifier. Accell USB-C VR Adapter with Extension Announced – Oculus Ready Certified!